On Monday — March 30 — Oregon will begin its spring practices and the page officially turned from the greatness that was the 2014 season. 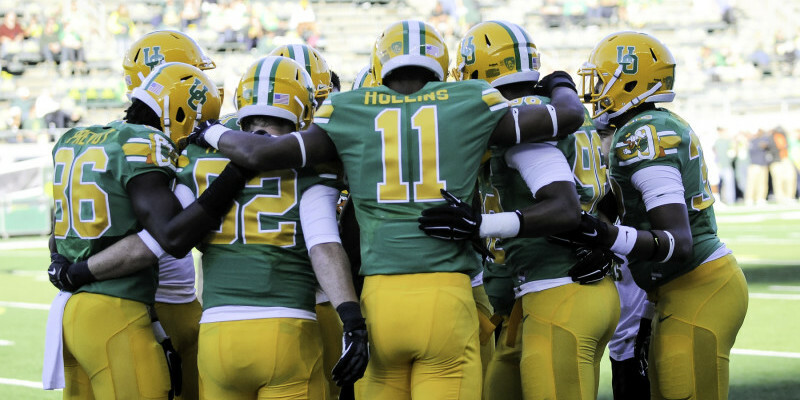 There are several key story lines to keep an eye on as the Ducks begin preparation for the new football season. The offense often gets the majority of the accolades, and rightfully so, but the Ducks’ defense has shown they are also to be respected. With multiple departures in the secondary, and newcomers on the defensive line, the veteran group of the defense will be the linebackers. Joe Walker is ready to be the defensive leader in 2015. On the inside, Oregon has return starters Joe Walker and Rodney Hardrick, and reserves Tyson Coleman and Danny Mattingly. Walker, a senior this upcoming season, will likely be the leader of a unit that is striving to be more impactful and consistent in 2015. Last season, the linebackers suffered spurts of poor tackling in the open field and a lack of gap discipline on the interior — see national title game “wham” play for examples of both. However, the inside-linebackers will have learned from past mistakes and are more experienced than they were last season. The outside linebacker position is where Oregon lost some talent, as seniors Derrick Malone and Tony Washington have both graduated. The experience and leadership of Malone and Washington will be missed, but there is talent waiting to step up. Torrodney Prevot, a junior next year, has two years of experience and is in position to become a great outside presence for the Ducks in 2015. If Prevot can improve on his 2014 season, where he had 30 tackles and 5 sacks, he could become a play-making force like Washington was last season. However, for the outside ‘backer reserves, there is some uncertainty about the depth chart, considering all other linebackers on the roster have little experience. 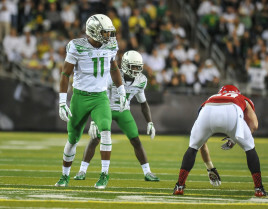 Justin Hollins adds talent to a deep linebacker group ready to step-up. Justin Hollins (SO), Johnny Ragin III (JR), and Jimmie Swain (SO) are names that Duck fans will start to become familiar with. Oregon rotates players frequently in games, so these inexperienced players could be in-line for significant rep increase in 2015. At 6’6 and 220 lbs, Hollins has the size and speed to become a lethal force on the outside edge, while Swain, a four-star recruit last year, has versatility to add depth to both linebacker positions. With reserve reps open for the taking, Hollins and Swain have the opportunity to stand out and earn their coaches’ trust, like Mattingly did last season. Don Pellum is in his second year as Defensive Coordinator and fans want an improved and more consistent defense moving forward. 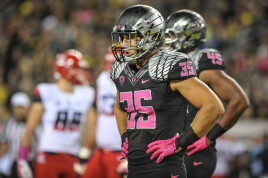 Next season, the Ducks look to have eight or nine linebackers in the rotation along with freshman wrecking ball, Fotu Leiato, and two junior college players coming in, that number could increase. With so much talent at the position, this group will be the strength of the defense in 2015.